Click here to see the article published by “Pets y mas” magazine about our “Pata de Oro” program (will open in a new window). The “Golden Paw Award” is presented twice a year by our organization and “Pets y Mas” magazine to honor local people in our communities for their compassion and service toward animals. Would you like to nominate a candidate for the “Golden Paw” Award? 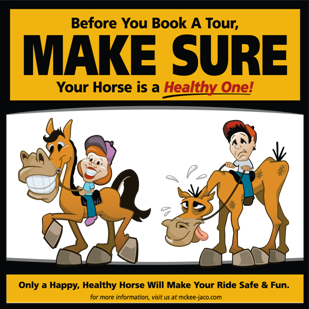 Please click here and fill out the form with the required information. Thank you for your interest in this program! The nominations for the next Golden Paw Award are due by May 15. If you know someone who makes our community a truly better place through the work they do with animals, please click here to fill out the form on our website or email us at info@mckee-jaco.com. 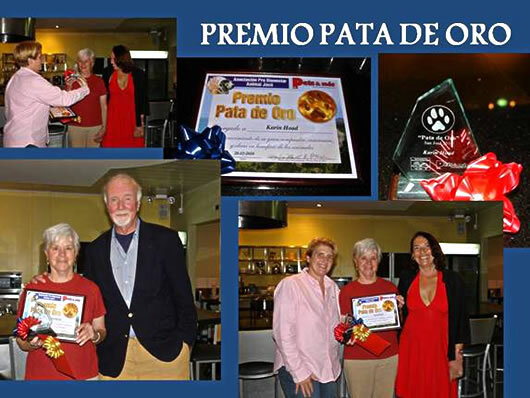 THE “GOLDEN PAW AWARD” is presented twice a year by both OUR ORGANIZATION and by the magazine “PETS Y MAS”, and its purpose is to honor local people in our communities for their compassion and service toward animals. On May 25th, 2014 this award was presented to Liana Robinson, a young American woman from Idaho who came to Costa Rica in 2008. Within the very first few days she was in our area, Liana had already made her first rescue – a beautiful black lab that she found hiding under her car after an accident. Liana took him in, took care of his surgery (his back leg had to be amputated) and this is how Ninja became a part of her new family here in Jaco. Liana has since become one of our most active volunteers. 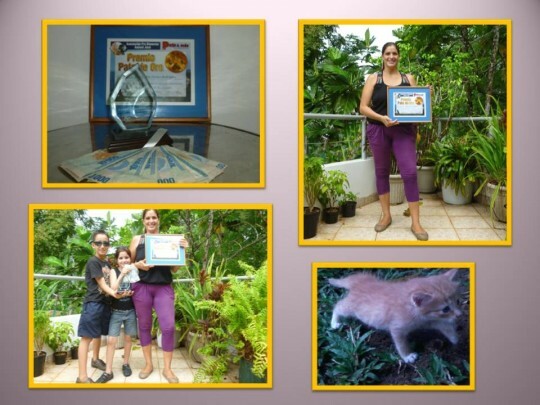 On May 23, 2013 this award was presented to Catalina Valverde – a young wife and mother who lives with her family in Atenas, but spends at least half of her time here in our county, visiting her family and taking care of the canine and feline population in this area. This is why roughly half of all her rescues come from the Quebrada Ganado/Tarcoles area. I first met Catalina in May of 2011, when she contacted me about organizing a spay day in Quebrada Ganado. It was the first clinic held in that location, and I was surprised at how much interest the people showed. While the surgical teams of students and vets from UNA were implementing the procedures, Catalina’s husband Dr. Victor Montenegro – vet and docent at UNA – was offering free consultations for animals with health problems, and most of the patients received not only a complete check up, but also a free blood workup. The day ended up with30 spayed/neutered animals, as well as many others attended by Dr. Montenegro. Since then, Catalina and myself stay in contact, and this is how I was able to get to know her and her entire family. With every phone call or Facebook posting regarding an animal in need, Catalina, either alone or with a helper, is already on her way to save another life, and she doesn’t mind driving 100 Kilometers to rescue an animal in danger. The animals she rescues get attended to and treated by her husband Victor, or if their condition requires hospitalization, at the University Clinic in Heredia. They all stay at Catalina’s and Victor’s house until they are 100% healthy, spayed/neutered and ready for their new homes. All this is possible thanks to the incredible involvement of the entire Montenegro-Valverde family, as all 3 children are also involved in this project – they all pitch in and help take care of the animals, not only seeing to their respective treatments but also giving them love and attention, which as we all know is often a key element in the recovery process, especially in the case of abused animals. Their house has become a shelter for all kinds of abused, neglected and injured creatures; besides dogs and cats, you’ll also find 2 goats and one pig, all saved from the butcher, a rabbit that was injured by a dog and even an old quail. And there are also different wildlife animals like sloths, macaws, parrots staying there as “short term tenants” who get brought to the wildlife rescue centers after receiving first aid treatments. Catalina’s life is all about her protégés. Also her husband Victor dedicates every free minute to his wife’s project. This extraordinary family does an incredible job saving animals lives, and all this without being a part of any organization. Sometimes they work together with Animales Atenas, sometimes with us, but for the most part they are on their own, working hard and spending every extra penny for their rescues. A HUGE Thank You goes out to Catalina and her family, for being such important and active contributors to animal welfare in Costa Rica. THE “GOLDEN PAW AWARD” is presented twice a year by both OUR ORGANIZATION and by the magazine “PETS Y MAS”, and its purpose is to honor the people in our communities for their compassion and service toward animals. On June 9th, 2012 this award was presented to Cynthia Orozco Rodriguez from Jaco. Cynthia helps all animals who happen to cross her path. Until about a year ago, Cynthia and her family were still living in their own house, set on a big piece of property where all animals were welcome at her place – she was one of our best foster homes for both dogs and cats. She and her kids were taking good care of all those which were sick and needed treatment, as they were staying with this extraordinary family until they got healthy, spayed/neutered and ready for their new homes. This had to change when Cynthia and her family had to leave their place and move to a small house where they are not allowed to keep any more dogs. So now Cynthia is taking care of kittens, especially those which need special care, like being fed with a bottle. Because her space and the tolerance of her neighbors is very limited (and there’s no more than 4-5 kittens at a time to take care of) Cynthia decided that she can also take care of animals in need which stay in other places, where the people are willing to let them stay on their property, but not willing (or able to) give them the necessary care. Kind of like ambulatory care, very common in human care. Cynthia visits the patients every day, some occasionally twice a day, feeding and treating them and making sure that they are receiving all that they need. She is mostly accompanied by at least two of her kids, which love helping her out. All 5 of her kids, and of course also her husband are involved in this charity work she performs every single day. Thank you Cynthia and family, for all the time and love you give to those furry little friends who so need your help. 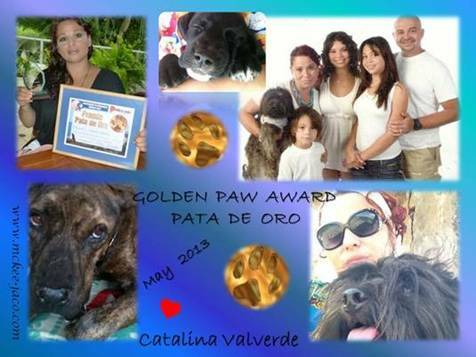 THE “GOLDEN PAW AWARD” is presented twice a year by both OUR ORGANIZATION and the magazine “PETS Y MAS”. 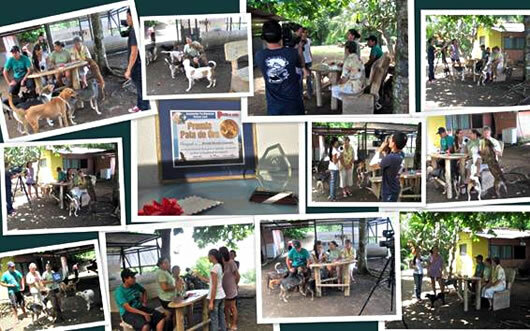 Its purpose is to honor local people in our communities for their compassion and service toward animals. InJanuary this year, the award was presented to Alfonso Guzmán Chaves from San Jose, who lives with his wife, 3 kids, 3 dogs, one cat and one rabbit in a humble little house where they all live in harmony, love and respect for each other. Alfonso never leaves an animal in need on its own – he brings it home and takes care of it until it is healthy, spayed/neutered and ready for its new life. His little house is always full of animals who are recuperating from their tough lives on the streets of San Jose. 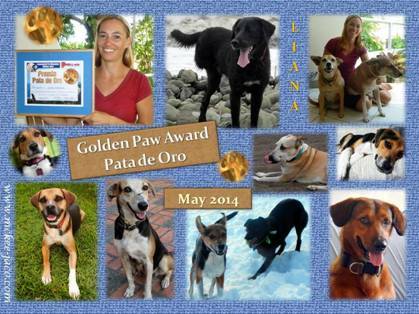 THE “GOLDEN PAW” AWARD is presented twice a year by both OUR ORGANIZATION and by the magazine “PETS Y MAS”, and its purpose is to honor local people in our communities for their compassion and service toward animals. On June 22nd, 2011 this award was presented to Brenda Morales Gonzales. Brenda came to Costa Rica by way of Nicaragua some 18 years ago, and it is here that she learned to love animals, soon making the decision to dedicate her life to dogs. And this is where she continues to learn so much about them, and where her affection for them grows so much. About 5 years ago Brenda was living with her husband Juan and son Marvin on a farm in Quebrada Ganado, and there wasn’t a week that went by that she didn’t end up bringing home some injured or abandoned animal which needed help. Because of her big heart, very soon the family was surrounded by 12 dogs, which became too much for the owner of the farm, who soon asks Brenda and Juan to either get rid of the animals or leave. Now Brenda and her family are heartbroken and don’t know what to do, but it seems that 2006 is to be Brenda’s lucky year, as she meets Patricia Holmer, a Canadian lady who just happens to live up the road apiece in Tarcoles, together with her husband Tonny and over 10 dogs and cats, most of which have been rescued from the streets. Patricia, a big- time animal lover herself, offers Brenda and her family a place that she and her husband are taking care of, a short 200 meters from where she lives, and she gives her permission to bring all 12 dogs she was taking care of on the farm. This is the start of a great relationship between these two extraordinary ladies. 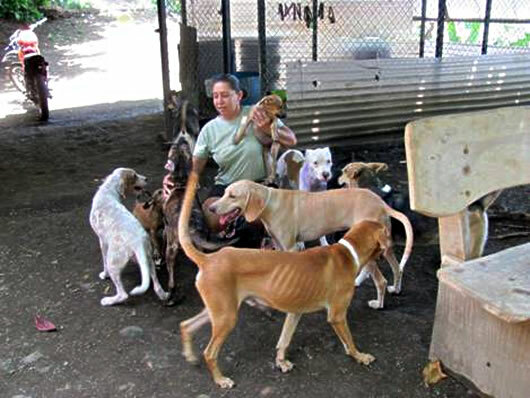 Today, between 20 and 30 animals live full-time on Brenda’s property, all rescued from a miserable life with irresponsible owners or from the streets, and she and her family not only take care of them, they also make sure that the animals get both the necessary medical care as well as spayed/neutered, in order to find good homes. Brenda’s son Marvin is (besides Brenda) the main caretaker – he’s learned how to inject animals and give them their treatments so that they don’t need to be brought to the clinic every day. Every free minute of each day Brenda and Marvin spend taking care of these animals, and they both have part-time jobs in addition to all this hard work they do at home! Their animals live in good conditions on a large fenced piece of property, and there is always enough food and fresh water for them. But the most important thing they have is the love and attention they get from all 3 family members — something they never knew in their previous lives. I’ve known Patricia and Brenda for over 5 years now, and I’ve completely lost count of the number of animals rescued by them – thanks to these extraordinary women, so many animals have had a chance for a new, better life, and we can only hope that more and more people will follow this example. 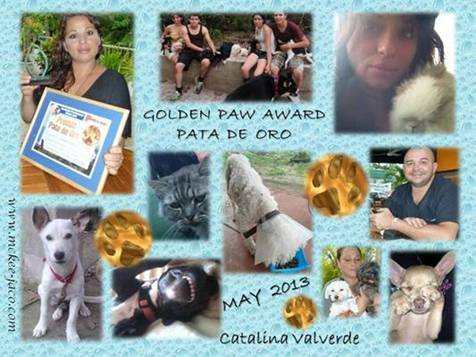 THE “GOLDEN PAW AWARD” is presented twice a year by both OUR ORGANIZATION and by the magazine “PETS Y MAS”. Its purpose is to honor local people in our communities for their compassion and service toward animals. 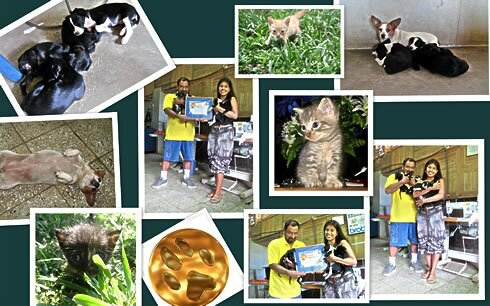 On January 14, 2011 the award was presented to KARIN HOAD, the director of ASOCIACION ANIMALES DE ASIS IN HEREDIA for her excellent work with and for abandoned animals in the Central Valley. THANK YOU KARIN FOR ALL THE TIME AND LOVE YOU GIVE TO THOSE FURRY LITTLE FRIENDS WHO NEED OUR HELP. 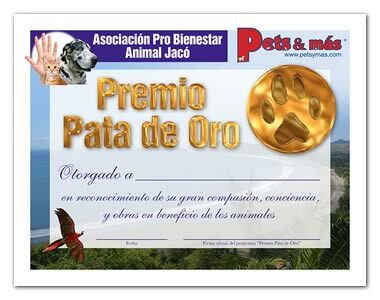 We proudly announce that starting this year, the Asociacion Pro Bienestar Animal (member of the McKee Project Costa Rica) will present its prestigious “Golden Paw” award together with the magazine Pets y mas. Once a year, as in the past, the presentation will take place in Garabito County, and the second presentation will take place in the Metropolitan Area of San José. The “Golden Paw Award” is presented twice a year to honor local people in our communities for their compassion and service toward animals. The winner will receive recognition from both our association and from Pets y mas, and also a prize of 100,000 colones (approx. $200.00) in cash, which is intended to be used in her/his work with animals. Besides this, there will also be special prizes from our sponsors – for example a weekend in a hotel at the beach or in San José. We will receive nominations for the next presentation until October 31st, 2010.They may come from any community member. Nominee must be at least 12 years old, must live in the Central Valley (when presented in San José) or in Garabito county and Esterillos (when presented in Jacó) and cannot be a McKee member or Pets y mas employee. Please click here to see a recent Pets y mas article on the award. THE “GOLDEN PAW AWARD” is presented twice a year by our organization to honor local people in our community for their compassion and service toward animals. 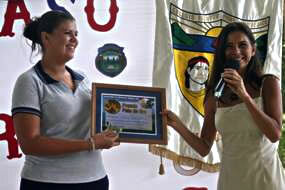 On June 16th, 2010 the award was presented to Shirlene Chinchilla Perez from Quebrada Amarilla. Shirlene, a sweet young girl with a big heart, together with her husband Carlos Bermudez, are really putting the effort towards making Quebrada Amarilla and the surrounding area a better place to live for all animals. Their house is full of happy, healthy pets, many of them rescued by Shirlene or Carlos, and many that were just dumped off in front of their house by irresponsible owners. Yet all of them find a loving home there, where they are cared for until they can get adopted. A visit to their home reveals just how much they care about our furry little friends — there’s the group of little abandoned kittens exploring their new place, the 5 adorable little puppies found in a box in front of their house happily playing with each other and there is an injured dog that was left on the side of the road that is now receiving the proper care. Please click on image to see a larger version in a new window. Shirlene and Carlos not only take care of animals in need, they also make sure that they find good homes and get spayed/neutered as soon as possible. Together they both run a little factory where they produce beautiful clothes, especially all kinds of shirts with logos on them, and a percentage of their income is always put aside in a special box in order to pay for castrations of their foster babies. I’ve known Shirlene and Carlos for over 5 years now, and I’ve completely lost count of the number of animals rescued by them — thanks to this extraordinary couple so many have had a chance for a new, better life. We can only hope that more and more people will follow this example. 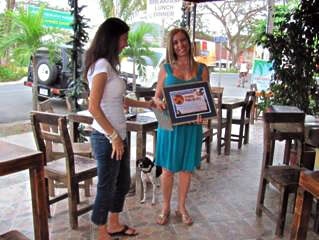 On December 16, 2009, the award was presented to Rossy Quesada Gomez, the popular owner of Cafe del Mar, located in front of the new park on Jacó’s main street. Rossy helps all animals who happen by her restaurant or her house. She feeds them when they are hungry, makes sure that they get fixed and fosters them until they get adopted. All animals are welcome at her place — she has 3 cats and 9 dogs of her own, with many others that are just visitors. Some of them she found injured on the street, others just came to her place and never left — and why would they? Thank you Rossy, for all the time and love you give to those furry little friends who need your help. If you would like to see the presentation “Life” — tune in to Channel 11 in January — we will inform you of the exact day and time. 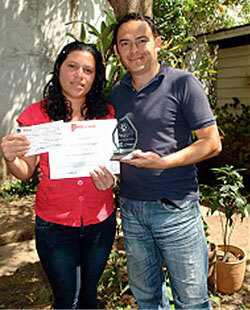 On June 16th, 2009 the award was presented to Maudy Cordero Cordero, a student of Colegio Técnico Profesional in Jacó. Maudy, who is only 15 years old, is trying really hard to make Jacó a better place to live for all kinds of animals. Her house is full of happy, healthy pets, most of them rescued by Maudy or someone in her family, and all of them loved and cared for until they get adopted. There’s the happy parrot singing away in the almond tree, saved by Maudy from a miserable life in a small cage, there’s the gang of little abandoned kittens scampering around the place, all hand-raised by Maudy and her Mom Aurora — this means bottle-feeding them every 4 hours, day and night. There are the adorable little puppies found in a box on a bridge, injured birds and whoever else is in need of human care. Maudy not only takes care of animals in need, she also makes sure that they find good homes and get spayed/neutered as soon as possible. Maudy Cordero is one example of what our young people are capable of achieving, and we hope that others will follow this extraordinary example. The ceremony was held at the gym of Maudy’s school with a presence of all its teacher and students. Many Thanks go to Allison and Shelach from SUNSEEKER PRODUCTION in Hermosa for their professional video and pictures from the ceremony. Colegio Técnico Profesional is the first school in Jacó where we presented our new education program “Sharing the world with the animals” and we were very well received by the directors and teachers alike. A huge THANK YOU goes to all of them for their help in bringing this message of responsibility, empathy and compassion towards ALL animals to our young people. If you would like to learn more about our education program, please go to our website http://www.mckee-jaco.com/ or send an email to info@mckee-jaco.comThank you for your time and support. Deseo ir a vivir allá y dar todo mi amor a todos los animalitos, no necesitó dinero, sólo donde dormir, con lo q recibo pago mi alimentación y cosas personales, ya crié a mi hijos ahora vivo sola con dos perrito fieles. Me pueden tomar en cuenta yo amo los animales y se q me voy a sentir amada!